Can Adversarial Contexts Be Socially Integrating? Recently, Michael Gillespie wrote an article on March Madness and the unifying character of sports in American culture. What is it about sports, and March Madness in particular, that it is able to organize and direct a group of otherwise — to borrow a term from John Rawls — “mutually disinterested” individuals towards impassioned support of a common goal? How can a mere game transform a diverse group of individuals into an almost singular consciousness, where personal identities dissolve into a shared communal existence? Gillespie answers similar questions in terms of Nietzsche’s view of Greek tragedy, which is, at its core, a merging of both the individual and communal elements of life (or the Apollinian and Dionysian). Nietzsche’s conclusion is ultimately that life is redeemed only as an aesthetic phenomenon, and a sense of meaning is derived from a sense of struggle in which the individual sacrifices his happiness for something greater. College basketball, and indeed sports generally, might play this redemptive role in American culture, as it is through sports that we experience life in all its peaks and valleys — from the ecstasy of an unexpected win by a buzzer-beating three-pointer, to the despair over an impossible upset in a tournament’s first round. Insofar as basketball is representative of the unifying character of adversarial institutions, how else might this dynamic play out towards a goal of social integration? That is, how might conflict help transform a Gesellschaft (society) into a Gemeinschaft (community), to use Max Weber’s terminology. A similar situation might be seen in the United States during World War II, where civilian support was widespread. It is well documented that the U.S. contribution to the war effort increased U.S. GDP, through increased productivity and the better mobilization of the workforce. This had a taxing effect on the U.S. population, but this struggle was tolerated because of, among other factors, some sense of unification expressed as patriotism. Indeed, this point about economies and markets as an expression of social integration is interesting. It has been argued* that Adam Smith’s Wealth of Nations, when interpreted in conjunction with his Theory of Moral Sentiments, Lectures on Jurisprudence, and Letters on Rhetoric and Belles Lettres, forms a comprehensive theory whereby markets are not exclusively constituted by interactions of “competitive and strategic individuals to secure their material preferences,” (553), but rather as a central mechanism for social order derived from the “inexorable struggle by human agents for moral approbation and social recognition” (ibid). This reading, furthermore, goes on to state how Smith perceived markets as an analogue to the classical Greek polis, as the site where people seek mutual recognition. Before we commit what Alfred North Whitehead termed the “fallacy of misplaced concreteness,” we would do well to recognize that this represents an idealization, which might be quite undersupported, especially in the context of contemporary market transactions. While Smith’s Wealth of Nations argues for lack of government manipulation and intervention in markets, the events of recent years has made some people skeptical of the efficacy of this kind of unrestrained free-market capitalism. Part of the problem is that there is rarely the sense of a common goal among actors within American corporations. Some economists such as Paul Krugman claim that the U.S. economy has become dominated by the financial sector, and one criticism against financial institutions is that employee’s have no personal investment in the firm beyond their limited tenure. Performance is usually assessed in terms of a very short time-horizon, and significantly long-term strategies to increase market capitalization might not be implemented if they sacrifice short-term performance. Obviously, I have no resolution for these difficulties. Perhaps adversarial contexts could be socially integrating, and the main issue is how might the unifying character of sports, for example, be applied to other adversarial contexts, like markets. Smith’s model might have been descriptive for its time, but it’s a real question as to whether our contemporary economic climate is one that can ever be socially integrating in this way. It might be that our attitudes towards the firm is unsupportive of individual responsibility towards the long-term financial health of corporations, insofar as this comes at the expense of short-term personal compensation. * Kalyvas, A. and Katznelson, I. “The Rhetoric of the Market: Adam Smith on Recognition, Speech, and Exchange,” The Review of Politics, Vol. 63, No. 3 (Summer, 2001), pp. 549-579. So far on this blog we have not talked much about the choices between adversarial and non-adversarial relations inside of firms. But this is a great context in which to sharpen our understanding of adversarial ethics, because we do have experience with much more and much less adversarial corporate cultures and industrial relations. The legal recognition and buttressing of labor unions from the late 19th century until, say, the 1980s, could be described in two ways: either as instituting deliberately adversarial mechanisms in the governance and management of firms, or as making an already-adversarial relationship between owners of capital (and their managers) and laborers less unfair. There are other ways of describing this contested institution, for sure. We’ll talk much more about what goes on inside the firm in the future; but at this point I would just like to flag a brief debate going on in the blog space at The Economist. Mark Thoma, an economist at the University of Oregon, proffers a brief answer to the question “What good are labour unions?” His one-sentence answer is, “Governments should replace unions as a protector of workers.” And of course, in many ways they have. Government occupational health and safety legislation, along with extensive bodies of employment law, now give to all workers what unions had to bargain tooth-and-nail for on behalf of their members. In an increasingly globalised world where digital and other technology allow firms to easily escape unionised labour, unions have lost their ability to act as an equalising force in negotiations over wages and benefits. Global labor organisations could provide an alternative, but this would require global institutions that do not presently exist, and that do not look likely to emerge anytime soon. For now, the answer has to come domestically and the only institution powerful enough to protect workers is government. Government-provided health and dental care, security in old age, workplace safety, insurance against job loss, higher education that is essentially free, and other such benefits would go a long way toward remedying what workers have lost since the 1970s. In addition, government redistribution of income may be needed to ensure that economic gains are shared more equitably. In combination, this would provide the things that unions fought to get for workers and maintain the current social protections that government provides. There seems to be a general trend to make more institutions adversarial, competitive, or “market-like.” Ed Sullivan got people to watch singers and dancers on TV, but now we won’t watch them unless they’re competing against each other and we can vote on who wins. But here is a proposal to make one very important economic and social institution — the firm — less adversarial. Or maybe just less fair. This is the inaugural post by Leonard Ng’eno and Michael McCreary. The Krzyzewskiville tradition involving hundreds of Duke undergraduates camping out for weeks in advance to get their single-square-foot claim on courtside real estate for one of the most highly anticipated events in all of sports has become iconic of both the institution and fandom at large. Duke fans, or Cameron Crazies, are known for their intensity and are proud to serve as the “Sixth Man” on Duke’s squad, providing an added advantage for the home team which is soundly reflected in the record books. As Duke undergraduates, we were obviously offended by Thorp’s cheap shot at our tradition, our team, and our friends, but after the initial sting began to fade we started to wonder: Was Thorp right? Is spending a month in a tent in order to see a premier basketball game a waste of time? We’ll let K-Ville residents speak for themselves as to whether or not their month outdoors was worth their while this year; the specific questions we wish to address are these: What is the function of K-Ville? What are its shortcomings? 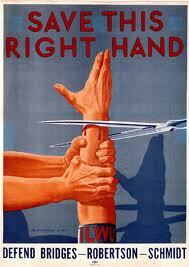 And is there a preferable alternative? The necessitation of K-Ville comes from the foundational economic principles of supply and demand, where supply represents the limited number of seats available and demand represents the number of undergraduate students vying for those seats. This excess demand creates the need for some filtration process to achieve equilibrium. In effect, tenting at K-Ville serves as a kind of “price adjustment” mechanism, increasing the cost (not monetary, but physical) of attendance and as a consequence lowering the demand. K-Ville, and lining up in general, functions from a deliberately adversarial point of view where many students are competing against one another for a limited number of seats. The principal shortcoming of K-Ville is that very few students—including the ones who participate—enjoy sleeping out in the cold while concurrently paying for a nice, heated room: grades suffer, relationships are strained, and comfort is sacrificed. Yet, it is K-Ville residents themselves who dictate their own fate. Living in a tent is not, strictly speaking, a requirement of attending the game. Admittance relies on a “first-come first-served” policy, and K-Ville residents are merely admitted because they are the first in line. In this way, we can see how lining up poses a serious collective action problem; one which, according to Professor Joseph Heath, “can easily degenerate into a race to the bottom, in which each individual, responding to the actions of the others, generates an outcome that is successively worse, but where each iteration of the interaction only intensifies their incentive to act in the same way.” While lining up early may be in one’s own self-interest in order to guarantee a spot, the inherently competitive move prompts others to line up earlier as well and can eventuate into months of waiting for hundreds of students. On the other hand, if the amalgam of attendees turned up just an hour before the game, the result would be the same as if they had lined up in the same order months ago. The primary problem in dodging this race to the bottom, however, is that there is no way to know who would commit to lining up first without going through the process genuinely (i.e. with every intent to sleep there for the entire duration). 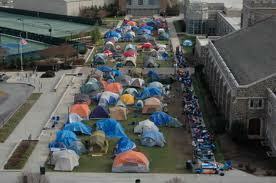 It could be conceived that one year K-Ville residents decided to form a pact, after completely intending to stay there the whole time, that said they would each get in line in their set order an hour before the game and avoid camping out. However, problems with this solution would be that there would be no way to prevent others from lining up during that time or to ensure that signatories of the pact would not break their oath. Furthermore, such an agreement would, to some extent, undermine the legitimacy of the next year’s line, as some might line up with an expectation to make another pact while some might not line up at all, thinking that they could just outwit the people who make the pact this time around. In essence, there doesn’t seem to be any way to artificially generate and ensure the results of the natural queuing process. To tackle this problem, we need to reduce the demand for seats by setting up a fair competition that does not lead to a race to the bottom. In arriving at our proposed solution, we took as a premise that a fair competition is one that favors those who want to go to the game the most (i.e. those who are willing to pay the highest price). This premise is not only founded upon common marketplace ideas, but also seems to be the source of legitimacy for the existing queuing system. Thus our method was to find some competitive system that would allow the most devoted students to demonstrate their fanaticism by paying a more productive and fun cost than standing in a line. By definition, costs are rarely productive or fun (you aren’t going to reduce demand by giving people free candy), and so it took some thinking to come up with something, but in the end we were pleased with our solution. We propose setting up a competition based on attendance of other Duke Athletics events. Those who have attended the most Duke games, of any sport, would get priority for the seating to men’s basketball games, including the marquee matchup with UNC. The university already has a system in place that rewards students for attending sporting events, called The Inferno. We suggest that The Inferno be expanded to not only give points to students for attending games, but also to reward students with game seats when demand is expected to exceed supply. Thus by basing admittance to the Duke-UNC game on a student’s attendance at other Duke games, we avoid the race to the bottom result that forces students to camp out for longer and longer periods each season in order to attend one game. Thorp has since taken down the tweet and apologized. Over at my Food-Ethics blog, I just posted a short piece called “Caution on ‘Green’ Claims for Organics”. It’s about a suggestion, from the head of a UK farming organization, for organic farmers to be cautious about claims that their produce is, categorically, more environmentally-friendly than non-organic foods. The interesting thing from the point of view of adversarial ethics has to do with the role of industry associations. Industry associations are a mechanism by which businesses that would normally compete against each other engage in certain forms of cooperation. The catch is that some forms of in-group cooperation are socially beneficial (or at least innocuous) while others are pernicious. For example, when companies cooperate on standard-setting (so that, e.g., competing models of computers can all use the same peripherals), that’s a good thing. When they cooperate on prices, that’s called price-fixing, and it’s bad for consumers (and is illegal in most places). In the case cited above, the organization is calling for a stop to in-fighting over the virtues (in the strong, moralized sense of that word) of various products. Whether that’s socially beneficial depends, in part, on the significance of the moral debate that the organization is hoping to stifle. Annual bonuses at top global banks are causing friction that could drive an outsized round of defections as weaker profits and tougher rules widen the pay discrepancy between star performers and everybody else. That growing difference between a small number of top-fee earning investment bankers and the bulk of their colleagues may see an exodus from big European and Wall Street banks to smaller upstarts or different industries in the weeks and months ahead…. Competition between industries to see which industry can attract (and retain) the best talent, at least to the extent that such talent is mobile and involves transferrable skills. Did I miss any layers? Each of those competitive structures of course implies its own set of ethical norms, both for those who design the institution and for those who are subject to it. The intersection between, and conflict between, those alternative sets of competition-specific ethical regimes, seems a fertile ground for investigation.